Mangaluru, May 17, 2015: A social concern is a must for medical professionals in order to discharge their responsibilities effectively in the health care sector, said Dr Hari Gowtham, former chairman of University Grants Commission. 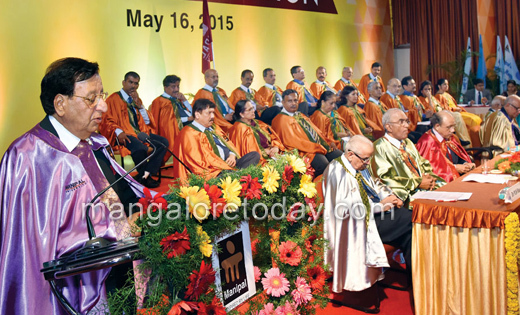 He was delivering the20th Convocation Address of Manipal University at the TMA Pai International Convention Centre on May 16, Saturday. He further exhorted the medicos to make good of the available opportunities instead of wafting for good opportunities.”When we are aware that time waits for none, there is no point in waiting for “good times,” he observed. Lauding the Manipal University as an institution catering to students from across the globe, he said the students of this institution have brought laurels. Pro-Chancellor Dr HS Ballal, Chancellor Dr K Ramanarayan, Dr PLN Rao, Registrar(evaluation), Dr Suma Nair, Student Welfare Director, Dr Anand R, Associate Dean of KMC, Mangaluru and others were present. Degrees were conferred to a total of 754 graduates, 674 post graduates and 35 Ph.D scholars. Dr Madhumitha V Herady, a student of KMC, Mangaluru was conferred Gold Medal for her outstanding academic performance.